April 10, 2010 - The driver of a fuel truck was seriously injured in a collision with a private jet airplane at King County International Airport (Boeing Field). He was taken to Harborview Medical Center. There were no other injuries. The incident occurred Thursday about 6:45 PM. A Gulfstream IIER private jet was taxiing westbound then turning southbound onto the taxiway A1 in route to the runway. 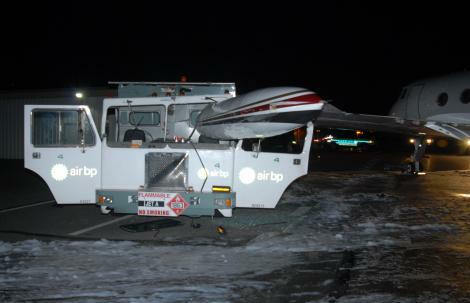 A fuel truck, owned by Galvin Flying Service, was northbound on the taxiway driving lane. The left side wing tip of the airplane hit the front windshield of the truck and entered the cabin area, trapping the driver inside. He was extricated by the fire department in serious condition. The fuel truck was empty at the time of the collision. The driver is 23 years old. The Gulfstream had a total of six occupants, including pilot and co-pilot, both of whom are from Van Nuys, California. The aircraft is owned by Jetstar Air of Beverly Hills, CA. The Sheriff's Office provides fire and police personnel to Boeing Field. The Sheriff's Major Accident Investigation detectives investigated the accident, and the investigation is on-going.